New NIS 20 and NIS 100 bills depicting female poets Leah Goldberg and Rachel Bluwstein were presented to the president of Israel, Reuven Rivlin on Wednesday at the President’s Residence in Jerusalem by Bank of Israel Governor Karnit Flug. The new notes were released into circulation on Thursday. 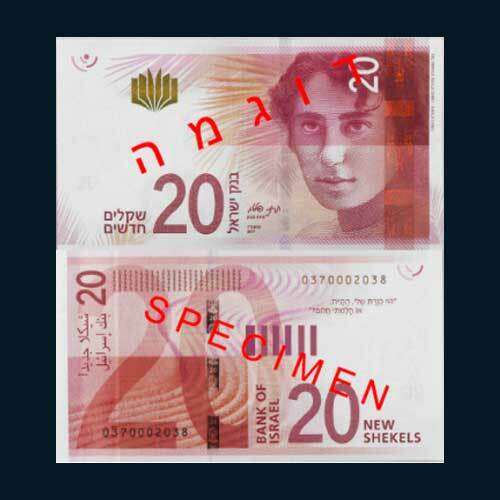 Rachel Bluwstein is featured on the red NIS 20 bill and Leah Goldberg is depicted on the NIS 100 note. A famous excerpt from one of Bluwstein’s poems “O, my Kinneret, Were you there or did I only dream?” is also featured on the new note. The president stated that the new notes represent the fact that Israel supports gender equality. They are a part of a new series of banknotes which celebrate women. The NIS 10 bill was released in 1985 and depicted a portrait of former Prime Minister Golda Meir. It was withdrawn from circulation in the 1990s. 10,000 shekel bill also featured Meir. After hyperinflation, the shekel was replaced by the new Israeli shekel in 1985. Many women were featured on the Israeli pound before it was replaced by the shekel in 1980. The NIS 50 Note features an image of Shaul Tchernichovsky who is a Russian-born Hebrew poet. The NIS 200 banknote depicts an image of Nathan Alterman who is a Polish-born playwright, poet, and journalist who wrote in Hebrew. The new notes come with improved security features. They are in varying length to help the visually impaired in identifying denominations. The currency notes of the same denomination will remain legal tender until they are slowly removed from circulation.